On 21st December we will be having our parkrun as usual but it is suggested that it is also an Xmas fancy dress event [for any that care to]. On Christmas Day, we will be holding an extra parkrun event at 9am and the course will be run in reverse. A week later there will be an extra New Year's day event at 9am which will also be run in reverse. There is also a New Year's day Valentines parkrun held at 10am so runners could take part in both events! Of course the extra parkruns will need some volunteers, so please get in touch asap if you are willing to help. The special parkruns will be held in addition to the regular Saturday morning parkruns, which will all be taking place as usual. The two extra parkruns will count towards the 10, 50, 100, and 250 club t-shirts. These extra runs will also count towards the annual points competition! please register for the second Wanstead Flats parkrun magic mile which takes place at 10am on Sept 7 after the regular parkrun 5K event. 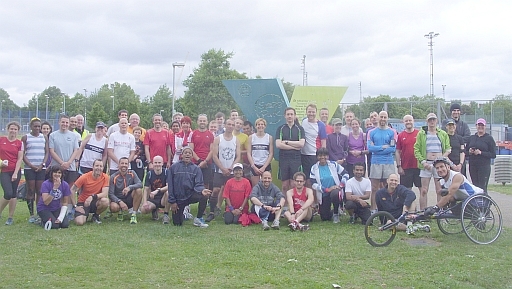 In 2010 and 2011 "longest parkrun" chains were held in London [South West] and in 2012 a North chain took place for the first time. For 2013 they are now joined by an East chain. Sunday June 23rd is the date for your diary. The 7 stages [in order] will be Walthamstow, Wanstead Flats, Valentines Park, Barking, Beckton. Mile End, Hackney Marshes. The reconfigured North chain will meet up with the East chain at the last stage for a friendly 'match off'. The runs are 'unofficial' Freedom runs [ie they do not count towards annual points competition], are a lot of fun, a great way to try local parkrun courses and meet people from other events, plus quite a physical challenge [if more than one are attemped]. The start of each successive stage is spaced 1.5 hours apart giving participants [and marshals/helpers] time to complete the course [suggested 45min cut off times] and get to the next stage. The first stage starts at 9am [Times: 9:00, 10:30, Noon, 13:30 15:00, 16:30, 18:00] giving a finish time after 7 stages of approx 7:00pm. Finishing times will not be officially recorded but runners are free to keep a record of their own times, which could be submitted at a later time. Participants are encouraged to cycle, use public transport or share cars to get between stages (or indeed jog!). The approx distance between the stages is 25 miles. There are decent public transport links between most of the stages. I have created this map to aid travel on the day. Hope to see WFlaters attending. Some may already know of this challenge? We encourage ALL to come and take part in an extra timed run of ONE MILE at 10am [after the weekly Parkrun event] on September 15th. Whether already Parkrunners or not. The course will start and finish by the usual parkrun course start/finish posts. Course: proceeding around the football pitch, down the avenue to the lampost, right along the tarmac path, right down the backs of the garages, through the firegate and then the usual run in around the football pitches. Please sign up at the link above and spread the word!! All abilities welcome. The City of London Wellbeing Festival is being hosted at Wanstead Flats, Harrow Road on the 1st September 2012. The aim is to inspire the local community to lead a healthier lifestyle, using local open spaces to participate in activity.